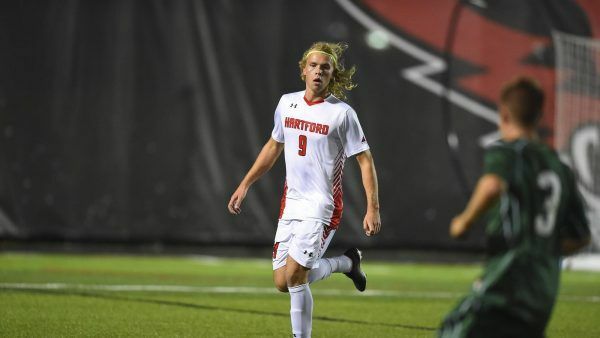 The University of Hartford Hawks Men’s Soccer College ID Clinic is a six-hour event that will run from 10:00 AM until 4:00 PM on the 29th of July. It is open to all male soccer players 14 years old and up who aspire to play at the college level. This soccer identification camp is going to take place at the state of the art Al-Marzook Athletic Fields which is in Hartford, Connecticut. In addition, this event provides technical and tactical sessions for both field players and goalkeepers. There will also be small-sided and full-sided games and a recruiting seminar. The camp registration fee is $150 per player. The University of Hartford is a private, coeducational, independent, nonsectarian university in West Hartford, Connecticut. It is a proud member of the National Association of Independent Colleges and Universities. The university is offering programs with accreditations from the Engineering Accreditation Commission of the Accreditation Board for Engineering and Technology, the Association to Advance Collegiate Schools of Business, and the New England Association of Schools and Colleges-Commission on Institutions of Higher Education. Furthermore, the University of Hartford is 176th in the National Universities category of the 2018 edition of the US News and World Reports Best Colleges rankings. It is also 57th in Engineering Programs rankings and 216th in Business Programs rankings. Currently, the University of Hartford is serving around 5,300 undergraduate students and around 1,700 postgraduate students. 49 percent of this undergraduate student population are male students and 51 percent are female students. This undergraduate population is also through a selective enrollment acceptance rate of 72 percent. Correspondingly, the University of Hartford student to faculty ratio is 9:1. In sports, the university has 18 men’s and women’s athletic teams competing in the America East Conference of the National Collegiate Athletic Association (NCAA) Division I. They are the Hawks and scarlet and white are their identity colors. The head coach of the University of Hartford Hawks men’s soccer team is Tom Poitras from Southington, Connecticut. Coach Tom Poitras is now entering his eighth season at the helm of the Hawks men’s soccer program. He is a bachelor’s degree in recreation and leisure studies graduate from Southern Connecticut State University. Coach Poitras is also a USSF ‘A’ coaching license, a USSF National Youth License, and an NSCAA Premier Diploma holder. Ultimately, Coach Tom Poitras is one of the most coveted coaches in college soccer. In fact, he has been already into five NCAA Tournament berths and three conference championships. Coach Tom Poitras is also the 1999 New England Collegiate Conference Coach of the Year Awardee. Then, the University of Hartford Hawks men’s soccer assistant coaches are Mike Kulas and Mirza Harambasic. Coach Mike Kulas, a Nutmeg State native is now entering his eighth season with the coaching staff. He is an alumnus of the Southern New Hampshire University. Coach Mike Kulas is a United States Soccer Federation (USSF) National ‘B’ License holder. Finally, Coach Mirza Harambasic is now in his fourth season with the Hawks men’s soccer coaching staff. He is bachelor’s degree in business management graduate from Davenport. Coach Harambasic is a USSF National ‘E’ License and NSCAA Goalkeeping Level 3 Diploma holder. Come and join the University of Hartford Hawks Men's Soccer College ID Clinic on the 29th of July. The program is set to start at 10:00 AM and end at 4:00 PM. Its venue is the leading-edge Al-Marzook Athletic Fields which is the home field of the University of Hartford Hawks men's soccer college team. Registration is on a first come first served basis.